Spotify scaled back its presence at South by Southwest this year, by some definitions. The Spotify House, one of the branded SXSW institutions that previously occupied a large space on the Eastside of downtown, is distinctly absent from the SXSW landscape. This has led to confusion among some attendees who have come to expect the familiar place. 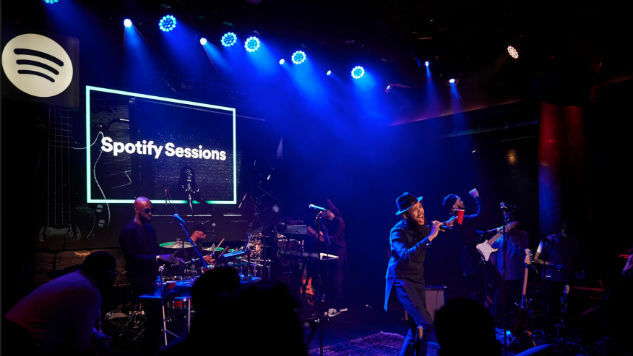 In place of the Spotify house, there is a lounge for artists and series of private concerts for what Spotify calls the “superfans.” The lounge for artist plays into the concept of some of Spotify’s current artist-oriented initiatives. They have a dashboard called Spotify Fan Insights, which is currently in limited beta. It’s designed to share some of the data they gather with artists. I sat down with Shane Tobin, Head of Creator Insights and Activations, for a meeting at Austin’s iconic Driskill Hotel. Shane had previously worked at The Echo Nest, a spin-off from the MIT Media Lab that was acquired by Spotify in 2014. The Echo Nest describes itself as the “industry’s leading music intelligence company,” and Shane sees great value in the collection and usage of music streaming data. Tobin emphasizes the potential utility of Spotify Fan Insights. A press release describes how the feature tells artists about their listeners’ demographic information where their listeners are, how the audience is evolving, how their fan base is listening and other music preferences they have. Artists have access to a dashboard where they can see this information that Spotify shares. Shane emphasizes that this could help artists plan their tours efficiently and to help artists recognize the superfans. The superfans are a big emphasis for Spotify’s outreach at SXSW this year. They are having private recording sessions with bands like: Jimmy Eat World, The Black Angels, Sigrid, The Lemon Twigs and Lady Antebellum. The session will be accessible to superfans who are recognized by Spotify for their passionate listening habits. This plays into Spotify’s “Fans First” program that identifies and rewards superfans with early sale concert tickets, special ticket offers, exclusive merch, special invites and other things of that nature. Here is where Tobin gets very excited. The email open rates are nearly 40% and this is five or ten times what most marketer would expect. Tobin seems especially proud of this result. Later on, attended a late night showcase at The Gibson Lounge above Maggie Mae’s, just off of the madness of Austin’s Sixth Street. I ended talking about Spotify with one of the musicians that played that night. I mentioned the Fan Insight’s feature—and she said that her band had used it to their advantage. She spoke positively of how it had been used to plan their tours, explaining that their frontwoman saw value in that sort of data. For now, the feature remains limited in its availability but Spotify plans to make changes and expand access on a time frame vaguely described as the near future. Only time will tell exactly how useful that data is in shifting revenue streams towards artists and helping them share their music to benefit fans create sustainability in their careers.